Topographically the Ludogorie is divided in eastern and western part by the valley of the former river Palamara – a right tributary of the river Senckovec. 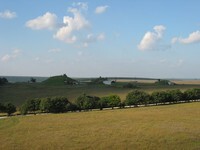 The right part is clearly delineated by the valley of the river Krapinets into long ridges stretching in a meridian direction; the eastern part has short slopes which follow the diagonal direction of the rivers Кana pool, Crooked river and Brestashka. The town of Isperih belongs to the western half of the middle plateau part of the Ludogorie and lies 24 km north from the Samuil station along the long Isperih ridge, which is closed between the rivers Senkovetst and Krapinets. The Samuil ridge itself begins from the Samuil station, descents straight to the north, narrows after the village of Bardokva, widens near Isperih and divides itself by the dry valley Konski dol (Horse gorge) into two planes – western Sveshtarska and eastern Jakumgruevska plane. The karts processes of long duration led to the formation of a unique to the region complex comprised from caves, rock niches, holes, etc. These land forms are of great interest to the paleontologists, speleologists and archeologists; The land forms contribute for the emergence of unique tourist activities as well. 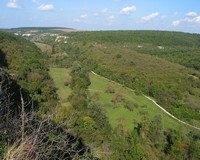 The most important highness on the Isperih ridge is the Mumdzilarska tell located near Sveshtari - 289 m of latitude. Due to the permeable barem rocks, which build the ridge, there are no springs besides Demir baba teke.